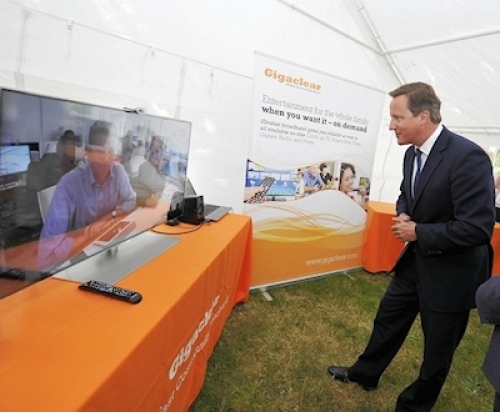 Residents and businesses in the Parish of Northmoor (West Oxfordshire, England) can now benefit from an ultrafast 1000Mbps capable Fibre-to-the-Premises (FTTP) network after the UK Prime Minister, David Cameron, turned up for Gigaclear’s official switch-on event. The new fibre optic network, which covers around 500 premises in Northmoor, Moreton and Bablockhythe, remains one of the few non-BT schemes to secure a slice of funding from DEFRA’s £20m Rural Community Broadband Fund (i.e. £186k that was then matched by Gigaclear). The deal itself was officially confirmed in March 2014 (here) and at the time Gigaclear predicted that the network build phase would be completed by September 2014, which is exactly what seems to have happened. The new service was thus officially switched-on by the Prime Minister on Friday 15th August 2014 (sorry we’re a bit late but for some reason Gigaclear didn’t put out their official PR until yesterday evening). It’s interesting to note that the original plan called for broadband download speeds of just 24Mbps+ (Megabits per second) to reach 100% of premises within the relevant footprint by 2015. By comparison Gigaclear has managed to deliver a 1000Mbps capable network and their press release is at pains to stress that a pure fibre optic connection will always be able to deliver better and more stable performance than BT’s ‘up to’ 80Mbps capable Fibre-to-the-Cabinet (FTTC) product. One downside is that the FTTP solution will only be available from Gigaclear and the packages start at £37 per month for a symmetric 50Mbps service that comes with unlimited usage, parental controls and a gigabit hub (plus a £100 installation fee). The faster packages will of course cost even more, rising to £69 per month for their 1000Mbps option. Admittedly this might seem expensive, although everybody should be able to get more or less the best speeds available and if you’re coming from an area where sub-2Mbps has been the norm for years then that’s quite a significant and welcome increase. Not forgetting that Gigaclear’s symmetric service gives the same speed for uploads as it does for downloads and, crucially, you don’t have to pay for BT’s phone line rental if you don’t want it. Absolutely brilliant news, it proves it can be done if there are people of grit around. Well done to Northmoor and Gigaclear. Not only have they got a futureproof network instead of copper crap they also have beaten the system and got funding for it, which proves their councillors have a grasp of physics unlike those in the rest of the country. Double win. As for choice, if you have chance of a company selling space rockets and 20 companies reselling donkeys then if you want to reach the stars one day you won’t buy a donkey. £6k per premises passed, £3k of it from the taxpayer. Ouch. Not sustainable to any scale. The first phase is always the most expensive, once the hub is in then hundreds more can be added to it. The biggest job is getting the feed in. Then it can expand, and once it reaches the towns it can make lots of money. It also provides much needed competition, so the monopoly has to pull its socks up and that is a win win again. If the incumbents start to provide a similar service the consumer will benefit. If BT is left to its own devices everyone will remain on the copper, with many on sub standard lines. This will be covered up in the superfarce statistics, just like it has been with the adsl statistics. Gigaclear are a breath of fresh air, blowing away the cobwebs from an obsolete infrastructure that is purported to be ‘fibre broadband’ but which can’t be if it comes through a phone line. The altnets deliver through fibre, real fibre which is futureproof and doesn’t respect distance or boundaries. Copper is so yesterday, and only fit for short runs inside houses and offices. The feed has to be fibre to cope with modern day demands. Please consider to add network in Telford. I don’t like BT FTTC because FTTC 80/20 isn’t future proof. I want Gigaclear Fiber 1Gbps and also without phone line. So, BT can say goodbye! Stick High Wycombe on your consideration map Gigaclear it would be good to have that in bucks too! Guys, Gigaclear don’t do urban areas and it would be extremely unwise of them to try to. They deliver to underserved rural areas not to urban areas with FTTC/cable available. Too much competition and incredibly hard for them to get the uptake they need to make a return on their investment. Asking people to pay £37 for 50Mb, even if it’s symmetrical, when they can get 100Mb from VM for less without a phone line, or 80Mb from Plusnet with a phone line, is a really big ask. Gigaclear have an excellent business model and plan, which is designed for rural roll-outs. They are set up to do what the Big Telco’s (BT and VM) are not good at doing. Let’s be fair the system and model that Big Telco’s use is not ideal for v.rural, also the have lot of overheads that make them poo for costings in that kind of environment. Read B4RNs business plan, both BT and B4RN admit big telco costs are not supportable. Gigaclear’s model with its minimum of 400 properties rules out many unserved rural areas. However once they are have established themselves then it should not be too difficult to use them to provide the backhaul for a wireless service to outlying areas. Hyperoptic and Gigaclear will one day taken over Virgin Media, Sky and BT in Fiber. Don’t forget Google Fiber eyeing UK too. That Google Fibre thing was from years ago and fell through for a few reasons. Hyperoptic haven’t build outside of MDUs, Gigaclear a few thousand rural premises. Not entirely convinced either of those two are suddenly going to get over 12 million premises passed any time soon. I GAVE them 450 properties in an area not viable and they said NO! And round here we WILL pay over £100 a month for 1gbps. Christ I pay nearly 60 now for 12/1! ! If there was no access locally/within reasonable distance to backhaul totally independent of BT then yes, they would have said no. Look on their website for their criterion – it is not just size of community. GC do choose their areas of interest very carefully – they ain’t stupid. I hope they explained to Mr Cameron in a fashion he understands, perhaps a pie chart or hired an American to tell him the same thing over and over until he agrees that this is over 10x faster than what he, his buddies and BT decided to spend hundreds of millions on. 10x faster because that’s what the interface speeds are. Is it significant that this is an upmarket area with soft verges? Northmoor is adjacent to existing GC completed and operational areas of Farmoor and Frilford Heath. So all their backhaul and associated infrastructure etc is already in place. It was always the next logical place – also that they were unlikely to get the 30% trigger level there so again worth approaching it from a RCBF perspective rather than a purely commercial one. GC are now moving on to starting work on the adjacent area of Standlake for which they have recently got to the 30% trigger level. So again its all a logical/strategic progression. I think it more likely that Virgin media might bid for GC at some point in the future….if the private equity owners decide to sell/get made a offer. Maybe GC will become a purely FTTP fibre infrastructure company if it farms off its ISP side for their customer to a major league ISP. Just to point out that as a condition of the RCBF funding there is a benchmarked-cost low cost plan which is actually £23/mo (including line rental etc) for 2Mbps symmetrical. Perfectly fine for browsing and email – and reliable, crucially. Always works. Even in flooding! Be interesting to see how much BT charge when they do their 1Gb trials in the next financial year or so. The previous report stated a grant of just over £200k. Any reason why this was reduced to £186k? It’d be good to know how Gigaclear has gone about wiring up the area. Digging up pavements? Microtrenching in roads? Delivery from fields at the rear of properties? Overhead distribution and/or final drop? From there to your house is your responsibility to sort out though GC have an installation partner Boxcom who can do it for you as GC supply a pre-terminated fibre install kit in 20m, 50m, etc lengths to those taking up the service. Ta. Google might be friendly, but the Northmoor website itself isn’t… I was browsing their site yesterday, and didn’t see those pictures! From one story, deployment looks to be typically running through soft verges. Installation costs seem to add quite quickly. 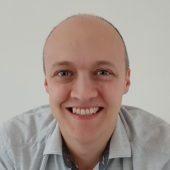 £100 connection fee to Gigaclear plus £95 minimum to Boxcom. From the pictures, some of those properties aren’t going to be covered by the minimum! But it looks to be a good deployment. Shows what happens when the local (amateur) team works with the councils, rather than against them. MikeW: The total amount the build actually cost was less than the grant given by the RCBF (and as this is match-funded/payment-on-invoice-of-completed-works, this means the RCBF will give out less to Gigaclear). Quite a lot of outlets rounded the grant amount up to 200k – it wasn’t such a neat number. The deployment is a mix of soft verge and hard drives/road. Certainly a large chunk of the project is in soft verges but it’s probably about 50/50 by properties – the backhaul is all easy though! Installs are £100 connection fee and you get the self-install kit for that and quite a lot of people go that route – it’s pretty easy for most people. £95 is for an engineer to come out, dig the trench for you, drill a hole in the house, and make it good, set everything up and test it. That includes a decent amount of digging etc. £37 is expensive for 50Mbps, virgin charges £26.50 once the price increase kicks in. 76Mbps FTTC is around £30/month. Their upload speeds are obviously lower but for most people that won’t matter. Can actually work out cheaper than both BT and Virgin (depending on package) if you want a phone service in addition to broadband (with BT obviously you have no choice and have to add on the line rental). Indeed as @Raindrops says if you take the GC base 50Mbps product and then go for a VOIP providor like Vonage over the fibre to give you your phone line then your ‘total telecoms bill’ for GC+VOIP service will be (I think) just less than BT FTTC 80Mbps service +BT line rental plus typical call package. Anyway GC have to set their pricing to an extent to recover the upfront capital/financing costs of building the FTTP village network in the first place, so no it will never be ‘cheap’ if you look at it purely as a broadband only service in terms of £/Mbps download speed.